We met Mahmoud Shahin in his tiny atelier in Christian Quarter of Damascus on a tiny side street called Sharia al-Qaimariyya when we were trying to get lost in this dream city. 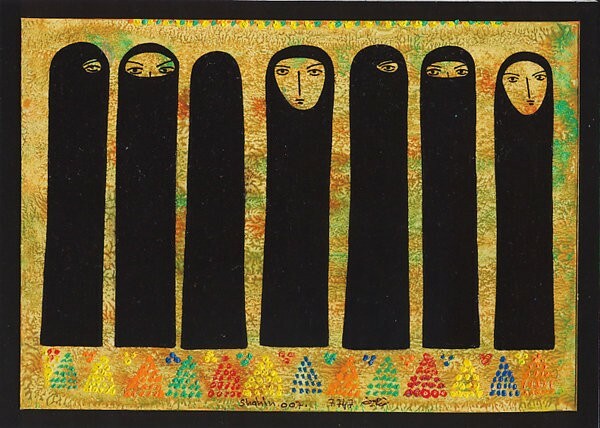 His collages and paintings of veiled women on his window caught my attention first. I wanted to see more and poked my head in. There were more in the atelier but I had that strange hesitation of entering somebody's private space. He saw us lingering in front of the door, gave us a look over his reading glasses, smiled and waved us in. When we were browsing his art work on the walls and shelves he started to ask questions about us, from where we are coming, what we are doing in Syria, etc. We talked about Damascus, Istanbul, Palestine, Middle East politics, history, soccer and food... He offered us Turkish coffee, showed some of his essays and prints and talked about himself, about his country Palestine. Born in Jerusalem in 1946, he left his home during the Israeli occupation in the late 60s and moved to Jordan and Egypt and then settled in Damascus, Syria as a member of PLO. He refers those days as his young and crazy days left behind and seems to be pretty happy to be in secular Syria and to be able to show and print his work unlike in other Arab countries where his work is still banned. Lovely time spent with an amazing artist. He kind of reminded me Slavoj Zizek. The way he expresses his strong criticism using also a good dosage of sense of humor on very delicate and serious issues mostly related to religion is amazingly impressive and powerful but his paintings are just a small part of the whole experience. You visit his atelier, you talk to him, listen to his approach to contemporary politics and religion, you learn about the problems of the geography and read his poems. Basically you enter the world of an artist who thinks about his culture, his people and his country at least for half an hour and then all his works start to make more sense to you. I brought one of his beautiful paintings back home. Now every time I look at it I remember him, Palestine and Damascus through his eyes. For any reason if anybody ends up in this amazing city and in this unreal neighborhood find him. I hope he will be still there when I am back... There are so many new things to talk.